The Yes Men follows a couple of anti-corporate activist-pranksters as they impersonate World Trade Organization spokesmen on TV and at business conferences around the world. Andy and Mike don thrift-store suits and set out to shock their unwitting audiences with darkly comic satires on global free trade. Weirdly, the experts don’t notice the joke and seem to agree with every terrible idea the two can come up with. Exhausted by their failed attempts to shock, Mike and Andy take a whole new approach for one final lecture. The Yes Men is directed by Dan Olman, Sarah Price, and Chris Smith, whose previous credits include the 1999 Sundance Winner “American Movie.” Join us for the free screening and a discussion following the film. 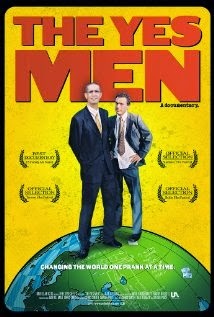 Watch the Yes Men trailer!